About Us - Электроточприбор – разработка и производство взрывозащищенных светодиодных светильников, щитовых, переносных и стационарных электроизмерительных приборов для тяжелых условий эксплуатации. “Elektrotochpribor” develop and manufacture over 200 products, including many patented devices. Our products are certified by the Federal Agency on Technical Regulation and Metrology (Rosstandart), as well as other regulatory agencies in Ukraine and Kazakhstan. Our association has many licensed dealers across Russia and the CIS. Devices manufactured by “Elektrotochpribor” are actively used by various industries, including nuclear power plants, oil and gas refineries, mining developments, as well as municipal transportation and railways. Many of our devices have been named as part of “Russia’s Top 100 Products”, in addition to having won many other awards at specialized contests and exhibitions. “Elektrotochpribor” is recognized as one of the nation’s top “bona fide manufacturers.” Such a title drives our team to put forth its best efforts in continuing this trend of excellency. The life of every project begins in the design bureau of our company. Here new, creative ideas transform into blueprints and even prototypes of devices that we eventually put on the market. The work of the design bureau is built upon a close relationship of several generations. A meticulous and thorough approach of the most experienced staff is combined with excellent knowledge of modern technologies and the innovative thinking of young employees. In the recent years, the design bureau has completely switched to paperless planning and designing using modern CAD software. Additionally, the company maintains numerous creative ties with the leading institutions in Russia and the CIS. After the blueprints are finalized, they are sent over to the blanks facility of our factory. The blanks facility prepares various metallic, plastic, and rubber parts that are used later in the assembly process. These parts are then covered in protective coating, over which come painted designs and scales for measurement instruments. Reflectors on LED lamps are metallized. Instruments of the “STURDY” product line pass additional vibration tests. Finally, our products are received by customer representatives, who perform a final check before sending our devices to consumers. A comprehensive system of monitoring and ensuring reliability of products is required at an enterprise that manufactures machinery to which special requirements apply. Our devices are built to work under extreme conditions: low temperatures of the north, humidity of coal drifts, as well as voltage spikes and strong vibrations. Vast experience, modern factory equipment, dedication, and careful control of all stages of production is what guarantees durability and safety of our products. 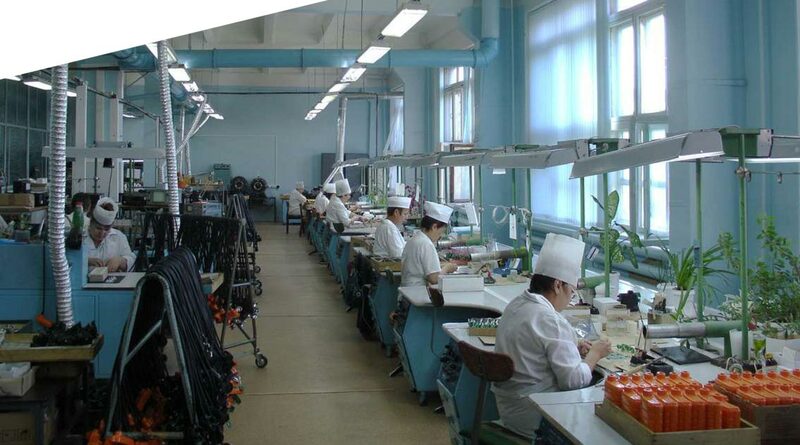 Omsk-based production association “Elektrotochpribor” is one of Russia’s leading manufacturers of measuring instruments. Our origins date back to the tough years of World War II. On July 13, 1941, the State Defense Committee decided to evacuate the Kiev Electrotechnical Equipment Plant to the city of Omsk, southwestern Siberia. In July/August of the same year, workers and factory equipment arrived to the city. The history of “Elektrotochpribor” is an example of how domestic instrument-making evolved over the years - from the early prototypes of war-oriented equipment to complex info-reading and computing devices. Today, “Electrotochpribor is one of Russia's largest manufacturers of electrical measurement instruments and mining lamps. The company bears the status of "Leader of the Russian Economy". We are fully certified and approved by Russian supervisory bodies, following all norms and production standards. “Elektrotochpribor” actively participates in both domestic and international competitions and exhibition fairs, having brought home many awards, both Soviet and contemporary. Over 500 products were manufactured by our plant during the course of its history, with 200 still produced and sold to this day. Some of the devices we design and assemble are not being by manufactured by any other company in Russia and abroad. "Elektrotochpribor" was the first company in the country to design and produce electronic switchboard meters with digital indication. Back in 1961, when launching the first manned spaceship “Vostok-1” with cosmonaut Yuri Gagarin into outer space, chief architect Sergey Korolev determined the launch time by the arrow of our measuring device. It is perhaps the biggest achievement and honor in our company’s history. And to this day, devices built by “Elektrotochpribor” are used both in space and in flight preparations on Earth. More than 150 employees of the company are recipients of medals and diplomas of the Cosmonautics Federation of the USSR and Russian Federation. The enterprise is also a two-time recipient of the Yuri Gagarin diploma. Our current products are well into their third/fourth generation, improved and refined. The devices are regularly used at various power facilities (including nuclear power plants), in coal, oil and gas processing, metallurgy, food industries, as well as municipal transportation and railways. A select group of devices manufactured by “Elektrotochpribor” are listed in the “Russia’s Top 100 Products” list. One of our biggest clients is Ministry of Defense of the Russian Federation - with particular interest shown in products of the “STURDY” series.